A reminder of what happened in the LAST CHAPTER... Athropolis was a beehive of activity, both above and below the waterline. Every Throp and Squallhoot worked as hard and as fast as they could - not an easy task amid the falling and crumbling ice and the puddles that seemed to be forming in every little dip and hollow. The ice was melting faster and faster and there were signs of destruction everywhere. Everything made of ice seemed to be cracked, chipped, or melting into strange and unusual shapes. But, there was still some hard ice left - now that the Throps could get to it. They began to carve the great propeller from a block of the strongest and oldest ice, taken, with the help of the Squallhoots, from an ice quarry deep in the centre of Athropolis. Hammers and chisels followed Ludi's plans and tore into the ice. Chips and splinters flew everywhere. The "junk", gathered from the sea over the centuries, now had a useful and important purpose. It was passed up from the caverns by the Squallhoots and carried away by the Throps. Slowly and surely, the bits and pieces of old things became new things. The treadmill to drive the great ice propeller began to take shape, and sail canvas from old sailing ships was sewn into new sails to fly from the battlements. Even the flags of ancient explorers flapped in the wind once again - continuing their voyages of discovery after many years of slumber. Toot scampered about the ice. He was happy that everyone was working together, but he was also very worried. "Oh, will there be enough time? Quickly, everyone! Work as fast as you can!" He called and shouted to everyone he met. "Don't stop - not even for a moment!" Ludi leaned out of his laboratory window. Such activity! Bodies scurrying back and forth, to and fro, up and down! He could see Crystal talking to the General. She was very excited about something, and he could see that the General was listening carefully. But then the General scowled, folded his arms and shook his head from side to side. Crystal, looking very disappointed, walked away. I wonder what that was all about, Ludi thought. Chisel in hand, he returned to work, chipping more plans and calculations into every available clear space of ice. Almost every flat surface was covered with drawings, diagrams and formulas. He was running out of room, but how could he erase anything when it was too warm to paint on another coat of ice? Ludi's big plan was magnificent! The tunnel would open into the ocean underneath the waterline, and after much careful measuring and calculating, the digging had begun. Although the enthusiasm of the Throps was very high, they would soon have to stop digging. The light reflecting through the ancient ice was beginning to dim as the tunnel plunged deeper and deeper and it was becoming very hard to see for anyone who went blind in the dark. Deep in the ice, the Squallhoots were also busy. Their tunneling skills were put to good use and crews of Squallhoots worked both down to the water, and upward to meet the Throps. 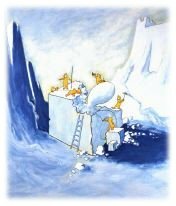 Their journey through the ice was a longer one as most of the iceberg was hidden underwater. In their underground workshops, the Squallhoots had almost completed the shaft to drive the great propeller. When completed, the long hard ice sections would be linked together in a connecting process known only to the Squallhoots. The propeller would be attached to the end, and then both the propeller and the shaft would be fed through the tunnel into the sea. The ice in the centre of Athropolis was still very hard and strong, so there was no danger if the Squallhoots sang. If you listened carefully, you could hear the songs drift up through the passageways.